يقع فندق أدينا للشقق الفندقية، سانت كيلدا، المصمم ليناسب كل الضيوف سواء كانوا من رجال الأعمال أو السياح، في مكان ممتاز في أحد أكثر المناطق تفضيلاً في سانت كيلدا. يحظى هذا الفندق ذو 4.5 نجمات بمكان ممتاز يسمح بالوصول إلى المعالم السياحية الأكبر في المدينة، فهو يبعد مسافة 6km عن صخب المدينة. إن سهولة الوصول من الفندق إلى المعالم السياحية الشهيرة الكثيرة في المدينة كمثل Consulate General of the Republic of Korea, اورورا سبا, Jewish Museum Australia هو استثنائي بحد ذاته. إن حسن الضيافة والخدمات الراقية التي تعرف بها TFE Hotels تغني تجربتك في أدينا للشقق الفندقية، سانت كيلدا. هذه بعض الخدمات الموجودة في هذا الفندق: واي فاي مجاني في جميع الغرف, مكتب الاستقبال على مدار الساعة, مرافق مخصصة لذوي الاحتياجات الخاصة, تسجيل وصول/خروج سريع, تخزين الأمتعة. لقد جهزت هذه الإقامة الفندقية بعناية فائقة لتوفر مستوى عالي من الراحة. في بعض الغرف يجد النزيل مواد تنظيف, إغلاق, شاي مجاني, مناشف, سجاد. كما أن مجموعة الخدمات الواسعة الموجودة في الفندق لضمان راحتك تترك لك الكثير من الخيارات لقضاء وقتك أثناء فترة إقامتك. مهما كانت أسبابك لزيارة ملبورن، فإن أدينا للشقق الفندقية، سانت كيلدا هو الخيار الأفضل لإقامة مثيرة وممتعة. Location was really prime - nestled in the midst of cafes and restaurants in St Kilda. The beach is a 20min walk away, but you can take the trams which are just a few mins away. There's a Woolie's just diagonal, so you can get any last minute shopping done! As for the apartment, it had all the basic necessities of a serviced apartment and was cozy. Even had a small balcony to get some fresh air! Bed was really comfortable. Housekeeping is speedy as well, and receptionist helps you to a great extent to figure out where to go. Only downsides were: (1) The apartment is divided into 2 sections for the hall and bedroom. The aircon is in the hall area, and so it took some time for the cool air to reach the bedroom. As there was a heatwave, i woke up sweating 2 nights as the aircon was not cooling the apartment enough. (2) There wasn't a safe to put my valuables. (3) The TV has very few channels. These are admittedly small downsides, and the apartment is a good choice! Very good location, easy for good and travel around. staff was friendly and helpful, inhouse parking was very reasonble and secured. room was very spacious just couple of items need to be fixed. Otherwise, overall was good stay! A very clean, comfortable and well equipped apartment. Great location, with tram stops and a good Woolies supermarket very close by. Lovely, clean and comfortable apartment at great location. Easy to get to, tram station and supermarket is just next to it. The kitchen in room is well equipment. Staff is nice and helpful too! Will definitely love to visit again! A very comfortable stay, the staff treated us well and were helpful and friendly. The beds were good and the room clean and with all you could need. 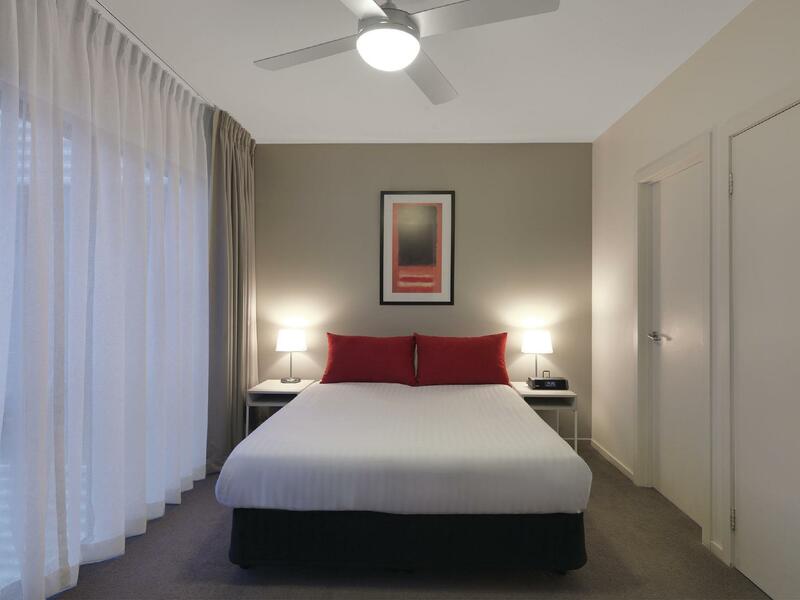 Its great to have an apartment style room with laundry and cooking facilities, a home away form home. We ordered takeaway Thai Food from Pattee Thai in Chapel Street, and it was delivered by Uber. All very affordable and good quality. I highly recommend this place. This is a great home from home. 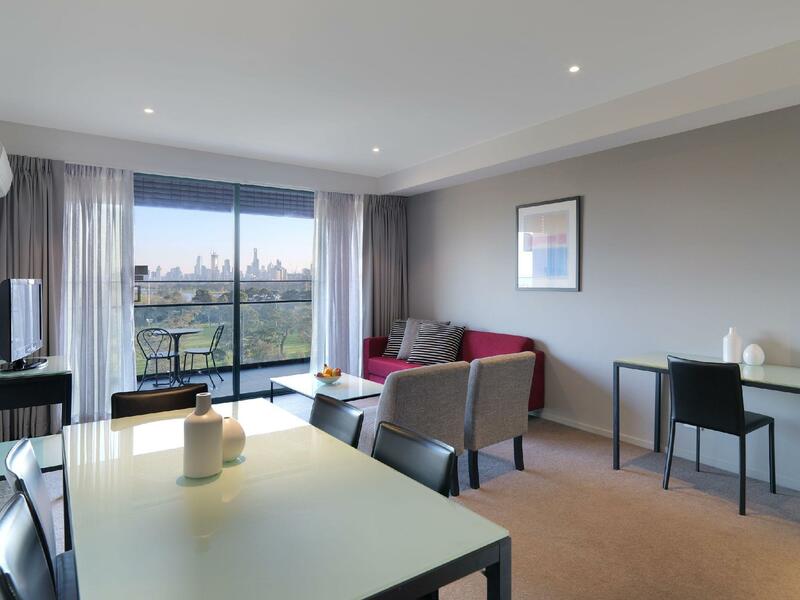 It can be a bit noisy at street level at the front but at the higher floors are fine and come with great views across Albert Park. A great spot with really friendly staff and management. Access to the tram network is just seconds away. 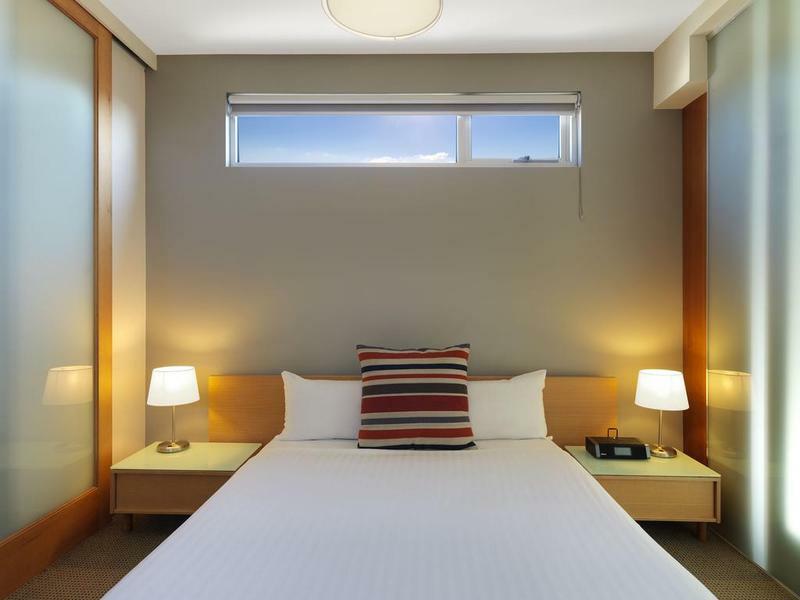 The rooms have everything you need for a great stay. Great sized room to fit a cot. Had washing machine and kitchenette that were really handy. Very easy to get public transportation plus theres plenty of restaurants a short walk from the hotel (some right downstairs) Really happy overall. 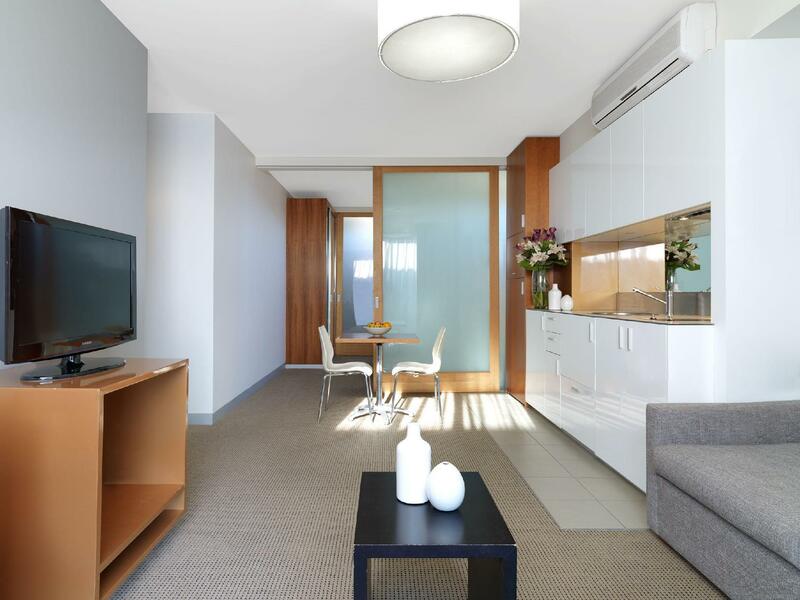 strategic location, nice view facing the park and easy access to public transport. Even though the first day of staying we encountered water leakage from the air cond but the quick response by the staff by shifting us to another room the other day really healed our pain. The location is accessible both to the sea ad well as to other part of shopping areas. 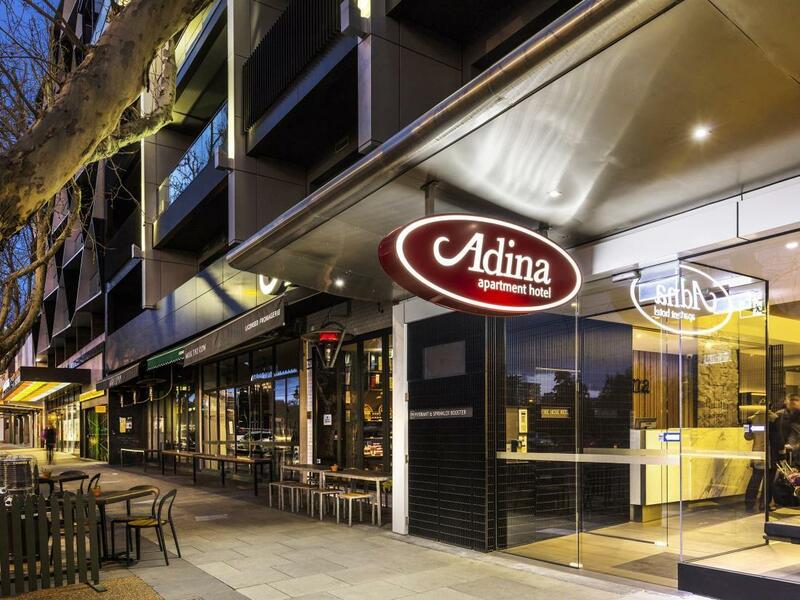 I enjoyed 5 nights at the Adina Apartment on Fitzroy Street, literally a short walk to all nearby shops (including the famous cake shops), restaurants and the beach in the quaint neighborhood of St. Kilda. The tram runs along Fitzroy in front of the Adina, making it highly accessible to all the sights of Melbourne's city center! As for the apartments, the property is clean and the apartment I had -- in the back building -- was huge, quiet, and very light. And, it had a small balcony which was the perfect place for morning coffee. The bedding was comfortable. I enjoyed having a full kitchen, which allowed me to buy groceries and do some minor cooking. The bathroom was large, and had a tub for either showers or baths. The bathroom sink was initially clogged, and it took two reminders to the front desk staff to fix the problem. It was eventually resolved. Oddly, I got stuck in the elevator one afternoon which stopped functioning as it arrived at my floor. I was able to open the doors and exit safely. This too was fixed quickly. Lastly, if a fitness center or gym is important, forget about the small one at the Adina, and go next door to the Anytime Fitness which you can enter for a reasonable daily rate. In spite of the minor issues, I would stay again, for sure! Friendly staff, beautiful city view, stairs in apartment ! Self Contained Kitchen, Close to the City, Tram away #96 Tram fr Southern Cross Station or #16 fr Swanson street near China Town. our stay at the hotel is great, although we were put in the back room, which i'm not complaining coz there is no street noise, really quiet, although trying to reach our room is like a maze, but the room is clean, although no room service cleaning during the boxing day we stayed. we will stay here again in the future, & after we check out we were able to still leave our stuff while we go around st kilda beach. The apartment had great facilities, everything you need to cook and washing machine/dryer etc. The only negative is the carpark underneath is very noisy with cars coming in and out early in the morning. Try to get a room on a higher level. If you are looking for somewhere with a gym - this one is not worth a look. Clean, comfortable and super nice staff well located in St Kilda. Restaurants and coffee shops nearby and trams at the front door.